You can kiss your WhatsApp on Blackberry Goodbye as WhatsApp is set to End Support. Home » Technology » Tips » You can kiss your WhatsApp on Blackberry Goodbye as WhatsApp is set to End Support. Recall 4 months ago we told you to gear up, as WhatsApp is said to have concluded plans to end support for its App on some device, such as Blackberry and of course Symbian phones. In vase you miss that, you can check here. Well we android users will gladly with open hands welcome your all to our platform, while am sure the iPhone users wont chase your back either. Just as the title reads, WhatsApp recently rolled out an update of its app notifying Blackberry users of its decision to finally put an end to WhatsApp on Blackberry, this was communicated to Blackberry users via a pop up notification message as seen in the picture below. 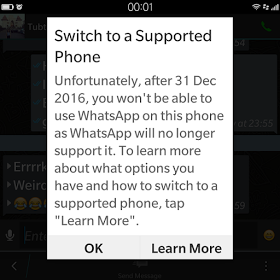 What this however means for BB users is that come 1st of January 2017 there will be nothing called WhatsApp on Blackberry. Well I guess is time i sell this Blackberry before it becomes obsolete.